There is a fierce nip in the air outside, but inside the temperature is almost tropical and the further you advance into the dark, the louder the noise becomes. This is the heart of the Lyon to Turin high-speed train link, where a tunnel boring machine is chomping through the earth, oblivious to the row within Italy's populist government over the project's future. 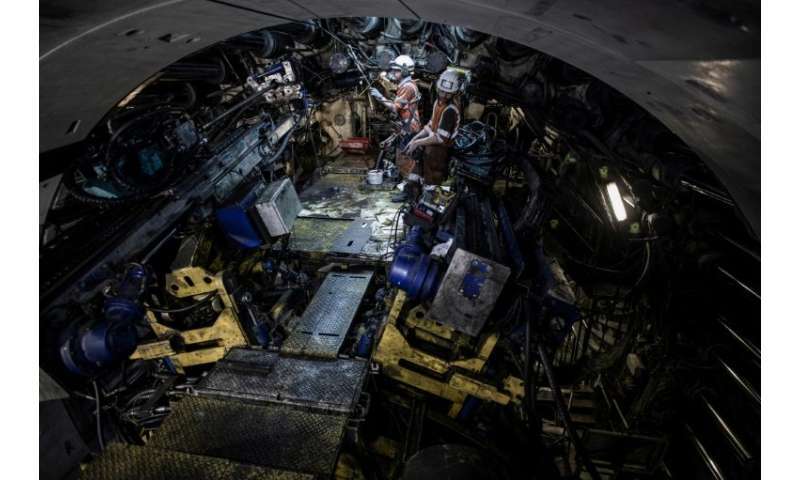 Underground in Saint-Martin-La Porte, in south-east France, some 20 workers are swarming around the mechanical beast in protective helmets, boots, noise-cancelling earmuffs and goggles. Beyond them labours the vast cutter, with 70 steel toothed wheels driven by generators as powerful as eight Formula One engines. 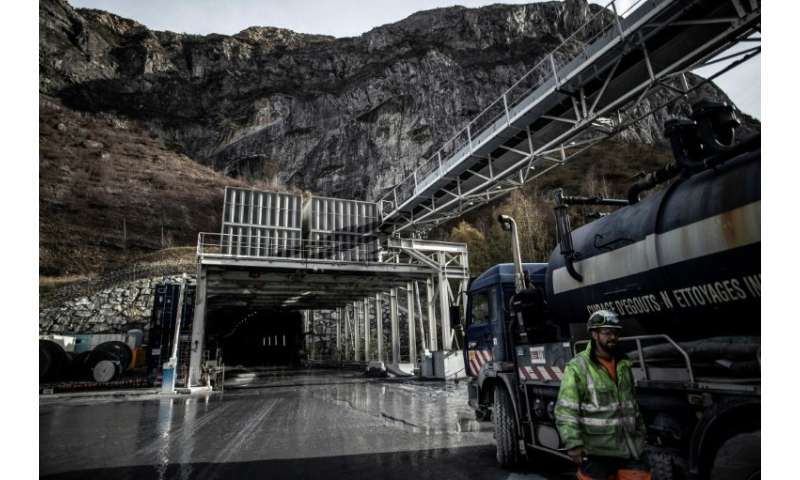 The finished tunnel is expected to stretch nearly 60 kilometres (37 miles), between Saint-Jean-de-Maurienne in the Savoy region and Susa in Piedmont, with 45 of those kilometres in France and the other 12.5 in Italy. From 2030, trains whizzing along this line would replace hundreds of thousands of lorries which currently rumble across the Alps. 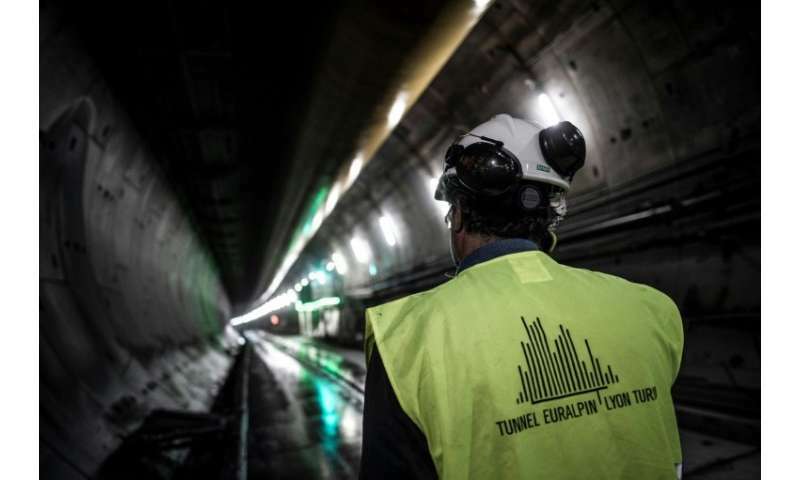 The two-way route will incldue 162 kilometres of tunnel space overall and workers have dug 25 kilometres so far, Piergiuseppe Gilli, construction manager at the Franco-Italian company Telt, tells AFP. Some 800 people work on the site in all. On the stretch between Saint-Martin-La Porte and La Praz, work progresses on two fronts. The type of rock in the Lyon direction demands the use of traditional methods, such as explosives, while a tunnel boring machine (TBM) nicknamed "Federica" ploughs the other way, towards Italy. 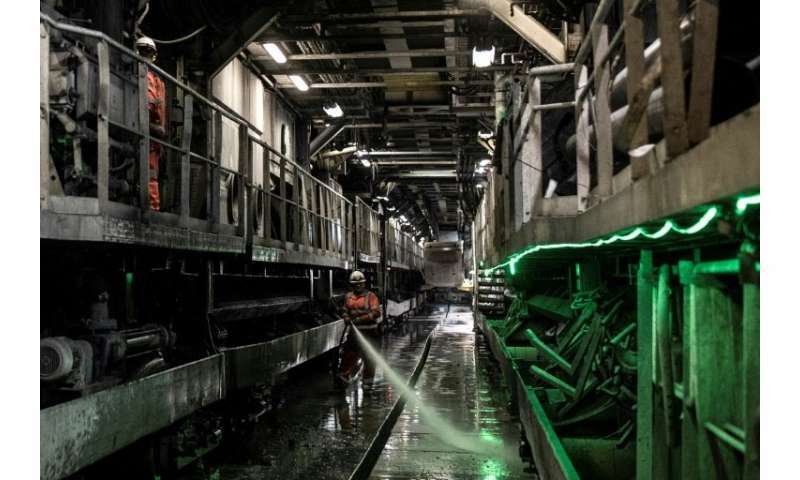 Six of the nine kilometres of this section have already been dug, including 5.5 by the TBM, which "is advancing at a rate of 15 to 18 metres (50 to 60 feet) per day, or 400 metres per month"—better than the 250 metres a month originally planned, said Francesco Gamba, works director at Saint-Martin-La Porte. Federica is huge: 11 metres wide and 135 metres long. She digs for 16 hours a day, and the remaining eight are spent on her maintenance. Her heavy steel wheels—each weighing 100 kilograms (nearly 16 stone each)—need to be removed and replaced four times a day by hand, because the blades wear out quickly. "You also need to replenish the oil and other liquids, and do the progress reports," says Gamba. Up on bridges, drillers check the rock's physical characteristics, from the presence of clay or quartz to water or gas. The speed is controlled by technicians who have eyes on Federica's process via video streamed to the site cabin, while the rubble produced is removed via conveyor belt. The voussoirs, blocks of concrete that form the tunnel's sides and ceiling, are brought in on rubber-tired trains and put into place using a sort of giant suction pad, with resin then injected into the gaps between them. Some 48,000 blocks will be used for these nine kilometres alone. The atmosphere in the tunnel is oppressive: the noise is deafening, the light artificial, and the exit and fresh air a long way off. Guillaume Nonfoux, a 31-year old tunneller, says those who work under rock are "like a family" where the key is "mutual help". But out on the surface, the tunnel has divided communities and sparked protests. Some 40,000 people rallied in favour of the project last month in Turin, and those opposed have planned a big demonstration for Saturday. "This valley already houses a lot of infrastructure, this project is useless. Traffic between France and Italy has dropped significantly compared to during the economic boom," argues Susa mayor Sandro Plano. But if the high-speed link is scrapped, "we cannot leave the dug tunnels without maintenance," Gilli warns. "We'll need to prepare a 'restoration' project, which will have to be approved both in France and in Italy".